What is the United Nations and the Security Council? The United Nations was set up after World War II to ensure that there were peaceful ways of resolving conflicts. It consists of a number of bodies. The most important of these bodies are the General Assembly, the Secretariat and the Security Council. The General Assembly is a one-vote-per-member forum, with representation from all 193 member states. 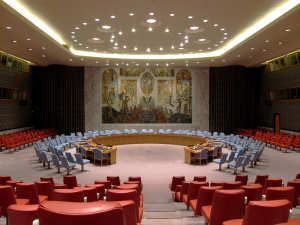 The United Nations Security Council has been around since the very beginning of the United Nations. Its mandate is outlined in the Charter, the constitution of the UN, where broad powers are given to the body. Especially powerful are the permanent five members, who always have seats on the Council and can single-handedly block decisions. Charter of the United Nations, Article 1 subsections 1-4. 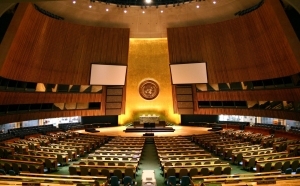 The United Nations is made up of a number of bodies and committees, among which the most important are the General Assembly, the Secretariat and the Security Council. The General Assembly is the main forum, where all member states have a seat and a single vote – no matter how populous or influential they are. The Secretariat is the administrative body of the United Nations and it is headed by the main UN representative, the Secretary General, who is elected for a maximum of two terms of five years each. The Charter gives the Security Council a special role in the UN structure. The Council is tasked with maintaining international peace and security, and is the most powerful body in the UN. This is because the Council, unlike all other bodies, can decide on binding resolutions that member states must adhere to. A criterion for any state joining the United Nations is accepting and implementing the binding decisions. The Council consists of fifteen member states. Ten of these occupy rotating seats, which means that they have a limited term of two years before having to reapply. Every year five members are replaced by another five, so that no rotating – i.e. non-permanent – member occupies a seat in the Council for more than two years. The non-permanent members are elected by the General Assembly. The remaining five members are the so-called permanent members. These seats are always occupied by Russia, France, China, the United Kingdom and the United States. Ever since the beginning of the United Nations this has been the case, although the Republic of China occupied the Chinese seat until the 1970’s when the Peoples’ Republic of China took the seat, and Russia replaced the Soviet Union in the 1990’s. Because of this the permanent members do not need to worry about getting elected onto the Council every two years to retain their seat. This is not their only extraordinary power, however. They also have the power to veto any non-procedural decision they do not like. Among the non-procedural decisions are binding resolutions on humanitarian aid, peacekeeping and reactions to crises – just to name a few topics. The veto means that not only do you need the support from nine members of the Council in total for a resolution to pass. You also need the acceptance of all five of the permanent members. A permanent member cannot vote “No” to a decision without the decision inevitably failing. They can, however, abstain from voting – which is often understood as a “No” vote where the permanent member does not like the proposal, but does not want to be seen as the obstacle to its passing. The veto has a great influence on the dynamics of the Security Council. The Security Council convenes whenever there is a need for it to do so. Because the Council has the right to determine what events are a threat to international peace and security, they also have the power to decide on what the UN can do in reaction to a conflict or a crisis. If the Security Council determines a conflict to be international in its reach, and therefore threatening to disrupt other states, the UN through the Council’s decisions can react strongly to ensure that the severity of the conflict is minimized. The Security Council has come to play a very important role in international relations. A seat on the Council is a desirable position for any state. It is also in the Security Council that decisions to respond to crises such as Libya, the Balkans and in the Ukraine have – or have not – been taken. While often sidelined by political schemes, the Council is still seen by the international community as the only body that can legitimately decide on the use of military force for reasons other than self-defense. See our page on The history of the veto, for information on the veto and how it came to be.